250.00 The performer free shows a tray. He blows up a balloon and attaches it to the tray. Upon his command, the balloon pops and a dove appears! Supplied complete with instructions. Dove not included. Note that we have only one of these in stock, made by Chalet Magic. 295.00 So you need to produce the rabbit at the end of your children's birthday parties do you? Hummm. How about a box you carry to the party that also serves as the cage to house the animal? An empty circus cage box is displayed. 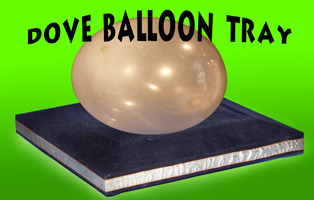 A long balloon is placed in the box in clear view. The children shout the magic words (you know, "Happy Birthday Joey"), the balloon pops, and INSTANTLY a rabbit appears inside! Of course you can use many types of other small animals, doves, or even fake plush animals for this fabulous effect. Limited production, get it while you can! 50.00 A great opening effect! The magician walks forward with a roll of satin ribbons in his hand. He unfurls the ribbons (holding the other end in his hand), and then begins to pull them back up through his hand. 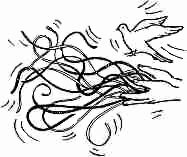 When the ribbons are bunched back together, he reaches into the ribbons and produces a dove! This is the professional model of this great trick. The ribbons and load bag are of the highest quality, and the method for securing the load is easy. Get it while you can. No dove included of course. 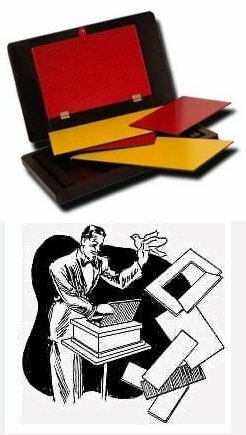 150.00 The magician displays a small rectangular box with an ornate open front. The magician drops into the box a rabbit, guinea pig, or similar live animal. He drops in a covering piece to hide the open front. Then comes the treacherous part! 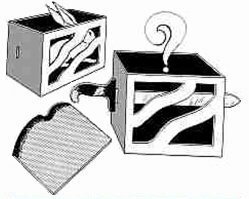 The magician picks up a long dagger and shoves it through the box, through the slits cut in each end of the box. The front covering is removed, and the animal has disappeared! If you prefer, the trick can be performed in reverse to make an animal appear. It is a great way to make the live rabbit appear at your children's birthday party. 75.00 A cloth bag is turned inside out and shown to be completely empty. The bottom of the bag has a zipper that the magician can open. Next the magician sticks his hands all the way through the bag and wrings his arms in a crisscross fashion to further show that the bag is empty. 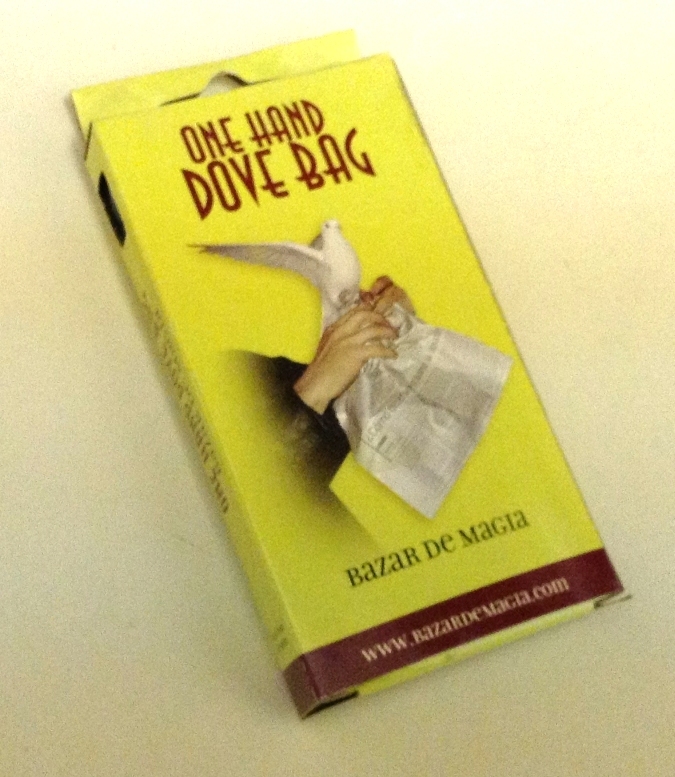 The magician removes his hands and zips close the bag. Next he does the impossible. He reaches into the bag and produces a live dove! No, there is no secret loading of the dove into the bag. The bag is completely self-contained. The only thing you need in addition to the bag is of course a dove. Instead of a dove, any small like sized animal can be used. Use the bag to produce silk handkerchiefs or anything else that will fit the bag. 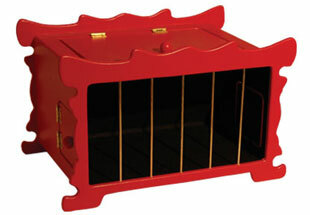 295.00 The magician displays a small animal cage. He opens the lid and places a dove inside the cage. The lid is closed. 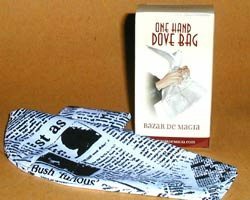 At the magician's command, the dove visibly transforms into a silk handkerchief! The effect can also be done in reverse. 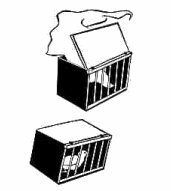 A silk hank can be placed into the cage and the hank suddenly transforms into a dove! 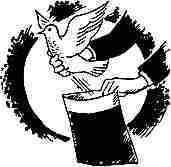 50.00 The magician places a dove or other object to be transformed into the folds of an ornate mat. 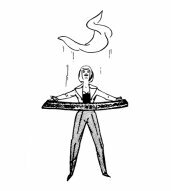 The performer pops open the mat and an silk handkerchief flutters upward! The dove has apparently been transformed! This effects features dowel ends to make the performance easy. It is a great trick to perform in fast succession with any other effect. Assistant is not required.